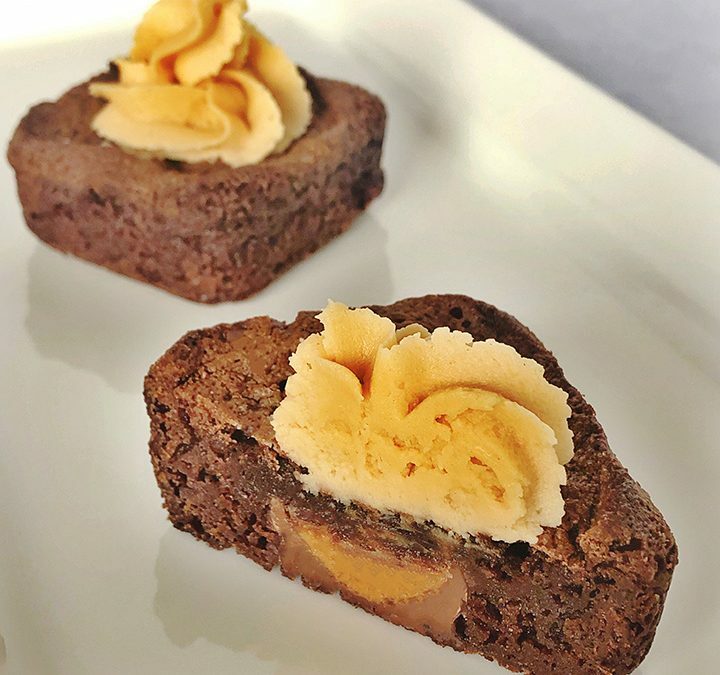 These cute little individual brownies are baked with a peanut butter cup in the center, then topped with peanut butter icing. Their portability makes them perfect for both indoor and outdoor spring events. Preheat the oven to 350˚F. Butter 15 of the cups in two 12-cup square brownie pans. Place 1 ½ cups of butter around the edges of a microwave-safe glass bowl. Add the chocolate chips to the center. Melt the butter and chocolate in the microwave on highest power for 1 minute, stirring at least once, and then in 30 second increments, stirring one time in the middle of each one, until the chocolate is almost melted. Remove and stir until completely melted. Set aside to cool slightly. In a large bowl, whisk the eggs until the whites and yolk are just blended. Stir into the eggs the brown sugar, confectioners’ sugar, granulated sugar, corn syrup, vanilla, and salt; mix until combined. Add the cooled chocolate mixture, stirring until completely incorporated. Stir in the flour to completely incorporate. Add a tablespoon of batter to each buttered cup in the brownie pan. Place a peanut butter cup over the batter. Cover with remaining batter until the cups of the pan are 3/4 full. Place the pans in the oven and bake until brownies just begin to pull away from the edge of the pan, about 18 – 20 minutes. It’s better to undercook rather than risk drying out the brownies. Let cool completely in the pans on a rack. Place the cooled pans in the refrigerator for one hour to set the chocolate cups. Carefully remove the brownies from the pan using a thin spatula. Wrap the brownies well with plastic wrap and refrigerate overnight. In a bowl, combine the butter, peanut butter, and salt using a stand or hand mixer. Add the powdered sugar and 1 tablespoon of milk, combine and then add the second tablespoon. Mix to a smooth, but still stiff consistency, adding any additional milk if needed. Use a piping bag or a spoon, top the cooled brownies an hour before serving.